The salary criteria for work pass holders to qualify for dependant privileges have been upgraded. If you are the main pass holder, this will enable you to upkeep dependants in Singapore. Dependant privileges allow family members to stay with foreign professionals while they work in Singapore. 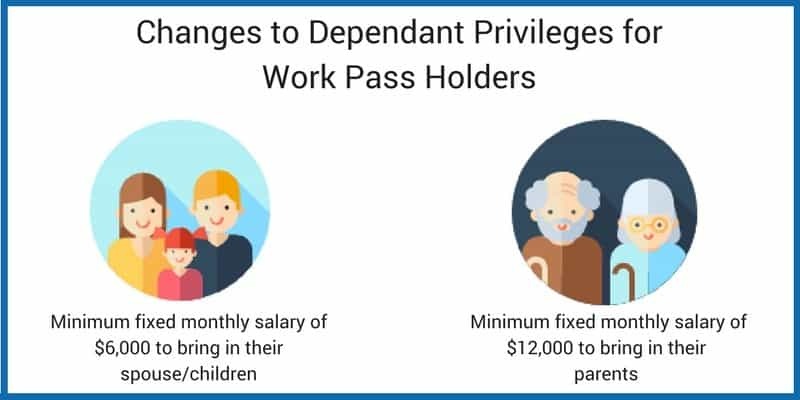 Your eligibility as a work pass holder for dependant privileges will depend on your economic contribution and ability to provide for dependants in Singapore. The changes will only apply to new Dependant’s Pass (DP) or Long Term Visa Pass (LTVP) applications made on or after 1st January 2018. The earlier requirements were an eligible Employment Pass (EP) or S pass, a minimum fixed monthly salary of $5,000 and a sponsorship by an established, Singapore-registered company. Related Article: What is Singapore Dependant’s Pass? New Dependant’s Pass applications for spouse/children as well as Long Term Visit Pass for parents received before 1st January 2018 will be assessed based on existing criteria. Renewal DPs and LTVPs approved or issued before 1st January 2018 will also be assessed on existing criteria as long as the main pass holder has a valid work pass with the employer. If there is a change in employer from 1st January 2018, the revised salary criteria should be met to retain the dependant privileges. The changes are still applicable if you work for an overseas company but hold an Employment Pass sponsored by a local entity. The changes are not applicable to dependants if you hold an Entrepreneur Pass (Entrepass)/ Personalised Employment Pass (PEP), which is assessed based on a different set of criteria. We are experts when it comes to Singapore's immigration laws and regulations. Our reliable guidance and high success rate comes with 20 years of experience. Secure your Dependant's Pass with us.